At Camel Premium Express Car Wash we know that how your vehicle looks is important to you. That is why we offer a full range of services at exceptional prices. 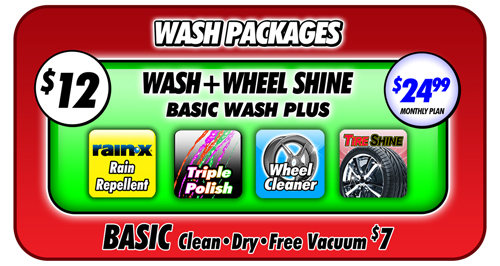 All of our wash packages offer great value. Our express tunnels make it easy to maintain the beauty of your vehicle in only a few short minutes. Our tunnels are equipped with the industry’s latest equipment. We use only the best soaps, waxes and polishers available. Our premium Manager’s Special wash is for our customers who want to keep their vehicle in tip-top condition. It includes BOTH our 4 step LAVA Shield package and our Hot Wax Protection package and is available in East Cobb exclusively at Camel Premium Express Carwash. An enormous amount of cleaning foam that covers your entire vehicle and begins our special Lava Shield process. During this step, a very strong soap is applied to your vehicle which is the strongest soap available in the Lava Shield service. It penetrates dirt the most effectively and breaks down grime built up on your vehicle. At this point your vehicle is now prepared for the Lava Seal. It a sealant that fills in the micro-abrasions contained within the clear coat and repairs them, just like a pot-hole being fixed! The final step of the Lava Shield service. During this stage, a waterfall of cold water rinses your vehicle from all the soaps and cures the bond between the finish of your vehicle and the Lava Seal leaving behind a long lasting spectacular shine! A superior wash that gives your vehicle a quality hand finish shine in only 3 minutes. Our unique application process applies Simoniz Pure Carnauba Wax to your entire vehicle. You will notice the scented soaps as you enter the tunnel. Your underbody is protected with rust inhibitor. Your tires are cleaned with our tire and wheel blaster. Your vehicle will be bathed in double tri-colored polishers and UV conditioners for added protection and shine. A spot free rinse is a given. RainX, Tire Shine and Bug Prep are always included. LAVA Shield, Hot Wax, RainX, Tire Shine and Bug Prep are available as extra services. We offer free vacuums, free drying towels*, free glass cleaner* and a free carpet mat cleaner with the purchase of every wash.
*We request that you return these items back to the cart when you are finished using them so that our other customers may use them also.